Blackberry shares around 17 % of the total Smartphone Market all around the world. Along the Blackberry OS shipped with the Phone you can additionally do more with it by using the Third Party Blackberry Apps. There was a world survey on the Blackberry Apps and following are the softwares which are topping the list. Google Maps was Ranked as the No. 1 Blackberry App to be used by the Users. Seems like Blackberry users are always lost somewhere or they are just exploring new places everyday. It gives all the local listings along with the places of the Mobile Towers Placed, turn by turn direction, also you can get to know where your friends as it have latitude integration feature. You can download Google Maps for Blackberry here. This is the most important blackberry app available on the Blackberry Platform. Still, it comes on Second Position in ranking. Using this App all the Blackberry Girls-Boys and Blackberry people stay in touch for free. To use this App you need to register with Blackberry and get you BB Pin (Blackberry Pin). 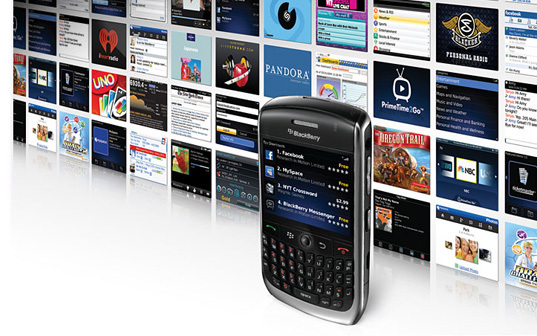 Many of the Smartphone Users switch to Blackberry just to use this Messenger and get there Unique BB Pin. You can download Blackberry Messenger here. All the Cell Phone users must be aware of Snaptu App. Viigo is just like Snaptu but only for the Blackberry Platform. Most popularly it is used as a RSS Reader, but it offers lots more service than reading your feeds. You can have a look at Weather, Sports, Social Networks, News, Flights, Travel, Podcast, etc. on the go by using Viigo. You can also subscribe to various feeds and it also have Google Reader Integration. You can download Viigo for Blackberry here. This Blackberry Dictionary have some cool features packed for you. It have word completion to ease your guesses, support voice pronunciation of every word to learn speaking it, also have its own particular feed as Word of the Day to increase your vocabulary. This is a collection of more than 5,00,000 words, definitions, synonyms, phonetic and voice pronunciation’s. You can download Dictionary and Thesaurus for Blackberry here. Today Social Networking is all about Facebook first, all the platforms have a Facebook support, and it goes the same with Blackberry also. This Facebook App works on the small Blackberry screen but lets you do most of the work that can be done using the full site. Also, its gives a very much Touch Screen Kinda experience also. You can Update your Status, Browse Friends, Poke, Read News Feeds and Messages and do more few things like browsing Photos using this Blackberry Facebook App. You can download Facebook for Blackberry here. These were the Top 5 must have Blackberry Apps you would like to download and use anywhere anytime.